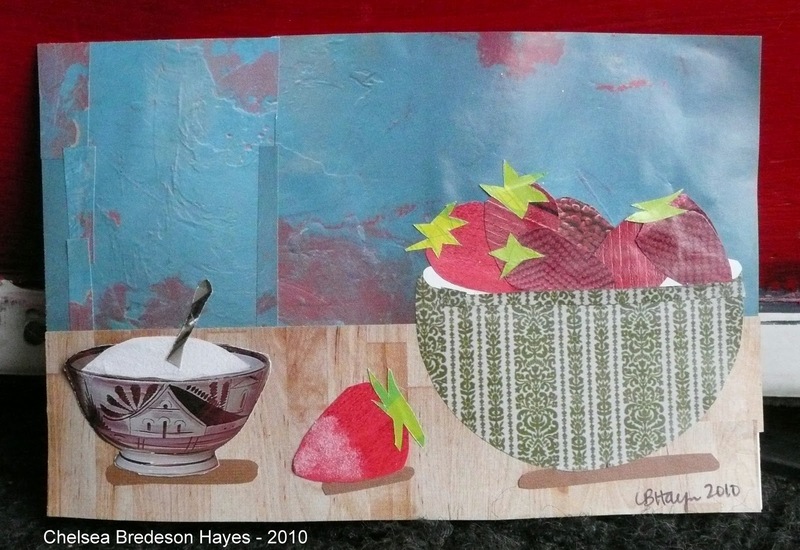 Strawberries & Sugar, collage on paper, 2010. One of my stronger early memories in life is of visiting my Grandparents in Billings, Montana. The climate and weather was so different than the Midwest and the day-long drive from Minneapolis was like traveling to a different world as a young child. When we arrived in Minneapolis my parents would often hand us over to our grandparents so they could sleep, go skiing, hike, or just catch a break. Some of the memories that stand out for me are watering the tomato plants and watching huge thunderstorms roll in off the not so distant mountains; watching the water rush through the irrigation ditches in the backyard; making peach ice cream with my Papa; feeding carrots to the horses across the way; visiting bluffs with petroglyphs carved in their sides; visiting a museum with a stuffed two-headed calf; chasing robins out of my grandparents’ cherry tree; visiting my grandmother at her work as a dietitian and playing with her rubber food samples; and eating strawberries dipped in sugar. This sugar and strawberries combination was one of the more decadent things we were allowed to do in grandparents’ care. This collage is just a small slice of those memories from Billings. My grandmother’s birthday is Christmas Day and this is to be her birthday gift.